Which trends are shaping the luxury goods industry, and how will they impact the way premium brands market to the affluent? 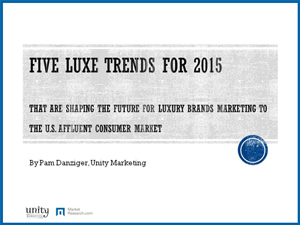 Luxury marketers are not limited to designer brands. A variety of corporations — from credit card companies to financial service providers to online retailers — are targeting the affluent consumer market. With 11.53 million millionaire households in the U.S., the American luxury market is the world’s largest many times over. But who are these luxury consumers, what are their shopping habits, and how can brands gain dominance in this important market? This white paper delves into these questions and provides valuable, actionable insights to help high-end brands connect with customers with the highest potential to spend.